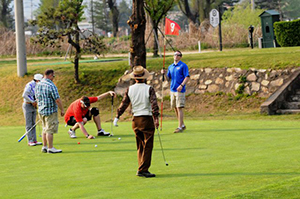 Golf is a unique game that requires immense concentration and impeccable technique. It’s a lifelong game that can take decades of continued play to master. Experienced golfers will tell you that their appreciation for the sport has only grown the longer they play it. While golf has had a reputation in the past for being an exclusive sport that’s reserved only for the wealthy, it’s growing rapidly in popularity among people of different backgrounds. More and more people are realizing the benefits of golf and giving it a try only to realize that it provides them with more benefits than they could have ever expected. Regardless of their background or skill level, everyone should give the sport a try. Here are five reasons to start golfing. While most don’t realize it, golf is a physically demanding game that can help to improve your overall fitness and health. To have complete control of your swing, you must have incredible core and upper body strength. You must also improve your flexibility and balance to ensure that the ball goes where you want it to. Many experienced golfers will improve their overall strength and power to improve their game. Beyond that, golf requires a ton of walking. Sure, golf carts are available to get you from hole to hole. However, walking the course can help you burn hundreds of calories during a game. Golfers receive great aerobic exercise without even knowing it. Every aspect of your life from fitness to proper nutrition will affect your game, essentially forcing you to get better. 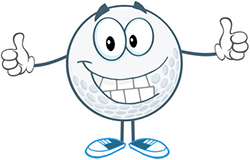 With regular playing, golf can help you get fit and improve your lifestyle. Beyond your physical wellness, golf is commonly used to help improve mental health and clarity. The game is a great stress reducer. It puts you in a calm and serene environment. In most cases, golfers are secluded from the surrounding world and are away from the daily rigors of life that cause stress. For many golfers, the game is a form of therapy that manifests itself in other aspects of their lives. In addition to stress relief, golf helps to challenge the mind and push you to come up with creative solutions to dominate the game. While there are common techniques that help golfers succeed, each shot is unique. You’re never going to make the same exact shot twice. You have to use your knowledge about the game and incorporate numerous variables like weather, physics, and terrain to ensure that your shot is successful. 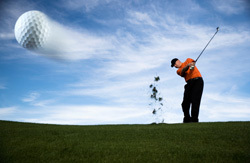 Golf can help to keep you sharp and focused throughout your life, ensuring that you never get complacent. No matter how many games you play, you’ll always be presented with a new challenge you have to overcome. Golf can connect people in ways you’d never imagine. During a game, players are spending hours together trying to achieve the same goal. While they may be competing to see who gets the better overall score, golf is really about beating the course. This shared struggle can help people from all walks of life connect. When you play golf with a group of people, you’re sharing techniques and experiencing the frustrations of trial and error together. Not only that but you’re in an environment that’s free of normal distractions. It gives people the opportunity to be more open and create a unique connection. This connection is why so many people use the golf course to network and build work relationships. Golf is a common hobby amongst CEOs and business owners, largely in part because of its challenges and stress relief. If you’re trying to impress your boss or seal an important business deal, there’s no better place to do so than the golf course. On a course, you’re in a relaxed environment. Even if you’re talking about business, the pressure of the office is gone, allowing you to talk freely and be more confident. If you’re used to working in a concrete jungle or being around the hustle and bustle of a big city, golf is a great way to experience nature at its finest. Golf courses are held to high standards in terms of appearance. They’re filled with rolling hills, natural vegetation, and plenty of sunshine. Golf courses are impeccably maintained on a regular basis. Flowers and shrubs are constantly manicured and grass is kept at an appropriate height for playing. Furthermore, many golf courses utilize environmentally-friendly techniques to stay pristine. They often use fewer pesticides and less water compared to other green spaces. As a result, you can almost guarantee that you’ll hear birds chirping and see other forms of wildlife as you play. Despite the incredible work that goes into maintaining a golf course, it’s a natural oasis that will make you one with nature. One of the best things about golf is that it’s accessible to everyone. Unlike other sports that require you to be a certain age or have a particular build, golf can be played by anyone. It doesn’t matter if you’re a man, woman, young, or old. Golf isn’t really about beating other players. Instead, your goal is to outsmart the course. As a result, everyone starts off with a level playing field. While some gear can help players overcome a unique obstacle they may be facing, the only real way to improve is through constant practice and dedication to the sport. Because it’s so accessible, golf is a game that can be played throughout your life. These are a just five of the many reasons why you should start playing golf. Every golfer has their reasons why they love the sport. It’s a unique experience that can provide you with benefits that last a lifetime. Even if you’ve never picked up a club in your life, there’s no reason to not give it a try.